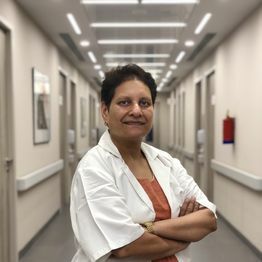 Dr. Renu Keshan Mathur brings over 24 years of varied experience and has previously worked with Artemis Hospital Gurgaon, Cloudnine Hospital, Gurgaon and as HOD (Obstetrics and Gynaecology) at Nazareth Hospital, Shillong. She has worked as a consultant with Ministry of Health, Govt. of Iran. She completed her MBBS and MD from Aligarh Muslim University. She had the honour of being felicitated by the Late Nobel Laureate Mother Teresa. She is well versed in gynaecology work and her expertise lies in performing hysterectomy, myectomy and other complex operations.